in Computer Stuff, Featured, Technology, What's new? ROUND ROCK, Texas, Dec. 2, 2013 – Dell today introduced the industry’s most complete portfolio of Ultra HD Monitors designed to meet a wide range of professional and consumer demands. Dell Ultra HD Monitors deliver stunning screen clarity and detail with four times the resolution of Full HD. From sophisticated power users such as video editors, CGI animators and game developers, through consumers seeking incredible onscreen clarity for entertainment applications, Dell has an Ultra HD monitor to meet the visual demands of even the most detail-oriented people. Featuring Dell PremierColor, Dell UltraSharp Ultra HD Monitors deliver accurate, precise color at virtually full spectrum coverage, and include support of major color industry standards including 99 percent AdobeRGB – the highest level in the industry – and the ability to precisely calibrate to the palettes users need for custom color work. The flagship Dell UltraSharp 32 Ultra HD Monitor delivers stunning screen clarity and detail with Ultra HD 3840 x 2160 resolution and high pixel density on an expansive 31.5-inch screen. Dell’s largest monitor allows for easy multi-tasking and viewing multiple applications side by side, and its ultra-wide 176-degree viewing angle ensures that images and colors remain consistent regardless of the perspective. 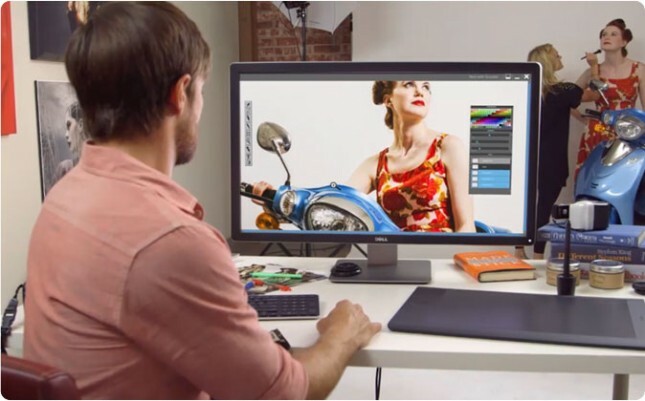 Designed for graphic designers, video and game developers, CAD/CAM designers, engineers, photographers and other power users, the Dell UltraSharp 32 Ultra HD Monitor provides an exceptional, high performance viewing experience. With the same remarkable, pin-point clarity, the Dell UltraSharp 24 Ultra HD Monitor, users can enjoy color consistency and precision from virtually any angle thanks to an ultra-wide 178-degree viewing angle on a 28.3-inch screen. The UltraSharp 24 Ultra HD Monitor allows customers to see more and do more with uncompromising picture quality that facilitates multi-tasking on a screen that delivers four times more data than a Full HD monitor. Customers also can rely on Dell’s industry-leading service and warranty coverage. All Dell Ultra HD monitors carry the Dell Premium Panel Guarantee, which means that if a user notices a single “bright” pixel during the warranty period, Dell will replace the panel. The Dell UltraSharp 32 Ultra HD Monitor (UP3214Q) is available globally starting at $3,499. The Dell UltraSharp 24 Ultra HD Monitor (UP2414Q) is now available in the Americas, starting at $1,399. It will be available worldwide on December 16. The UltraSharp 28 Ultra HD Monitor (P2815Q) will be available in early 2014.